Thank goodness for Janet Yellen, and China’s provincial governments. That was clearly investors’ thoughts, when they bid up chemical company share prices during Q1. For as the chart above shows, there was nothing in the fundamentals of supply and demand to suggest economic recovery was finally underway. 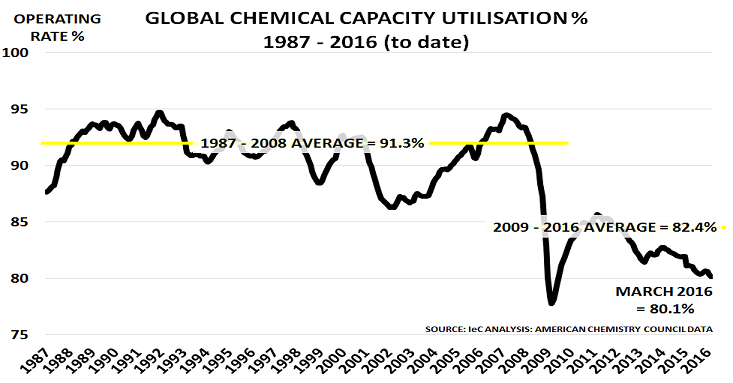 Instead, the latest American Chemistry Council data shows that global capacity utilisation fell to 80.1% in March – a new low for the current cycle. Oil prices thus repeated the 50%+ rally seen this time last year, causing downstream companies to panic and restock heavily. This was very good news for chemical company profits, and for investors’ share/debt portfolios. But as my quarterly summary of company results shows below, company managements were more realistic about the outlook. Some product areas, such as polyolefins, did very well. And US company earnings were boosted by the temporary rise in the cost advantage of their gas-based feedstock. But many companies reported customer resistance to rising prices, suggesting volume was being driven by the restocking phenomenon rather than underlying demand growth. Those companies such as Arkema who have embarked on long-term portfolio transformation efforts may well prove to be the real Winners over time, once markets recover from their excitement over the dollar’s weakness. What happens to your business, or your investments, if demand fails to return to the supply-driven Comfortable Middle Scenario forecast by consensus thinking? This is the question raised in our new Study, Demand – the New Driver for Profit (jointly produced by International eChem and ICIS). We suggest access to low cost feedstocks on their own is no longer enough to drive sales and profit growth. These 2 Scenarios create major risk for your business. In polyethylene, for example, the Collapsing Demand scenario reduces demand by nearly 10 million tonnes by 2030, compared to the Comfortable Middle scenario, and by 14MT in the Continuing Tension scenario. Similar downgrades occur in other value chains – PP volumes reduce by 7MT and 11MT respectively; PTA volumes reduce by 10MT and 16MT. What would happen if we were right again, this time with our paradigm shift argument? We are delighted with the support that the Study has already received, and hope you will consider purchasing it. It focuses on the new opportunities for growth now opening up in critical areas for the future, such as in averting likely water and food crises. The polymer industry could generate major revenue and profit growth in these areas, if companies adopt new, demand-led, business models. Please click here to download a copy of the Prospectus, and contact me at phodges@iec.eu.com for further information. The key is the move into today’s New Normal of lower demand growth. The blog has added a red line to the ACC graph, showing the lowest OR% seen during the SuperCycle. at around 88%. Since 2009, OR% have never managed to reclaim this level, with the initial post-Crisis rally running out of steam in 2011. Also interesting is that OR% growth was only up 1.3% in N America, despite the shale gas cost advantage. This is yet further confirmation that lowest cost is now no longer the key driver for OR%. Instead the highest growth was seen in China, up 11.1%. This highlights China’s move into export markets, to replace slowing domestic demand, as the blog has identified in core products such as PVC and PTA. The ACC also report that global chemical industry production is only up 14.6% today versus average 2007 levels, again confirming the lacklustre nature of the recovery despite the $33tn of policymaker stimulus. April data shows that relatively strong areas included coatings, consumer products and pharmaceuticals, whilst inorganic chemicals, petrochemicals and plastic resins were weaker. The data continues to highlight how GDP growth is no longer an accurate guide to future growth levels. Companies who focus instead on age range and income level are likely to see the best results in future decades. “Not with a bang but with a whimper”. The blog’s 6-monthly webinar for the American Chemical Society (ACS) takes place next Thursday, 5 June, at 14.00 Eastern Summer Time. And once again, the ACS has kindly arranged for blog readers to register for it free of charge. As feared in last December’s Year-end Review, the promised economic recovery has disappointed. US GDP instead actually fell 1% in Q1. Is there enough demand to justify $100B+ of US shale gas investment? How will China’s new economic policies impact the world? Opportunities from rising life expectancy and falling fertility rates? The blog will be joined on Thursday by Mark Jones of Dow Chemical Corporation, who will moderate the webinar. We will discuss the key issues and trends likely to impact in H2. And, of course, we will respond to questions from our audience. The webinars are now in their 6th year, and continue to prove very popular. Please click here to register for next Thursday’s event. Overall, therefore, as the ACC chart shows, capacity utilisation was 87.5%, well below the long-term average of 91%. The only good news is that recent modest new capacity increases, up just 2% versus September 2012, meant operating rates improved from last year’s 86.6% level. The problem, of course, is that a large number of companies are now investing in major new capacity, in the belief that all the central bank stimulus effort will lead to a return to strong growth. But in fact, as the data shows, this capacity will find it very difficult to find a home. A similar picture is shown in this week’s cover story in Chemical & Engineering News, the magazine of the American Chemical Society. Its latest employment survey is titled ‘Its Not Over Yet’, and describes how today’s ‘Slow economy has chemists still searching for work, and trying clever strategies to find it’. Its main survey Still Waiting for Good Times includes analysis of the outlook by the blog – please click here to read the full article.